for film petit this month…BUELLER! so so fun, you guys (do i say that every time? i might). Jess, Shannon, and I each picked one of the three main characters in 1986’s Ferris Bueller’s Day Off, directed by John Hughes. though the movie came out when i was pretty little, i’ve seen it quite a few times, especially in high school. it’s about three high school kids, Ferris (ringleader), Sloane (girlfriend), and Cameron (best friend) who skip school and end up having an epic time in downtown Chicago, narrowly escaping discovery by their creepy principal and family at every turn. i sewed a mini version of Ferris’ best friend, Cameron Frye (played by Alan Ruck). he’s a hypochondriac, nervous, goofy guy that’s really great at impersonating adults on a phone call. 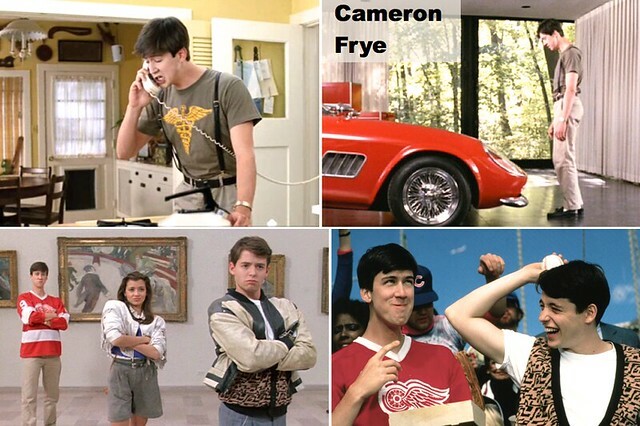 Ferris ropes him in due to the fact that Cameron’s dad has a red Ferrari that Ferris uses to dupe the school into releasing Sloane. he is the most reluctant with the most to lose in the escapade, but he joins in. Cameron has a couple different looks, and i got a big kick out of shrinking it down for two-year-old O. i realized that this is probably the least “costume-y” outfit i’ve made him yet for film petit, and i’m sure he’ll wear these clothes a ton. aside from the cream knit on the jersey, tiny bit of plaid, and the suspender supplies, the fabric here is all upcycled from my husband’s donate pile! for the chinos, i used the basic pocket pants pattern from Growing up Sew Liberated in 2T. i narrowed the leg and eliminated the cuffs, adding a faux fly and a slightly wider waistband with patch pockets in the back. 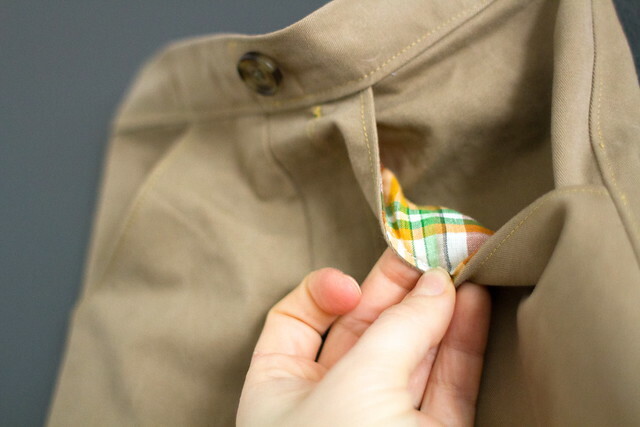 the pockets have plaid lining to invoke the tam that Cameron wears in the movie. 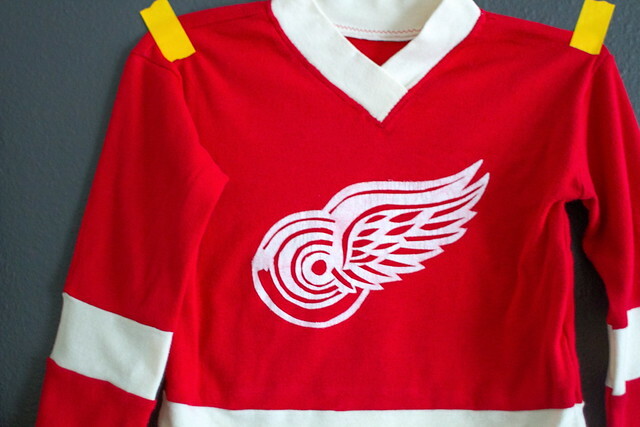 the red wings hockey jersey is the vintage v-neck from blank slate patterns in jersey knit sewn in 18 months; i added color blocked cream bands and freezer paper stenciled a red wings logo on there. 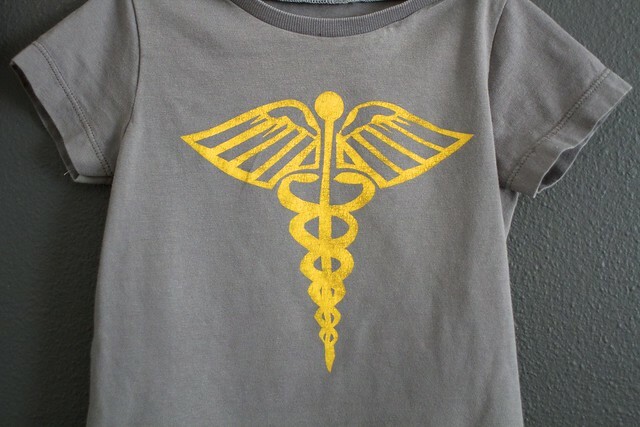 the gray caduceus shirt is my fave – it’s so simple but has such a unique style to it. 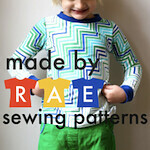 pattern is Rae’s flashback skinny tee in 2T with short sleeves and another freezer paper stencil. i applied the fabric paint lightly for a more vintage-y look. i found both freezer paper stencil outlines via google image search and cut them by hand. 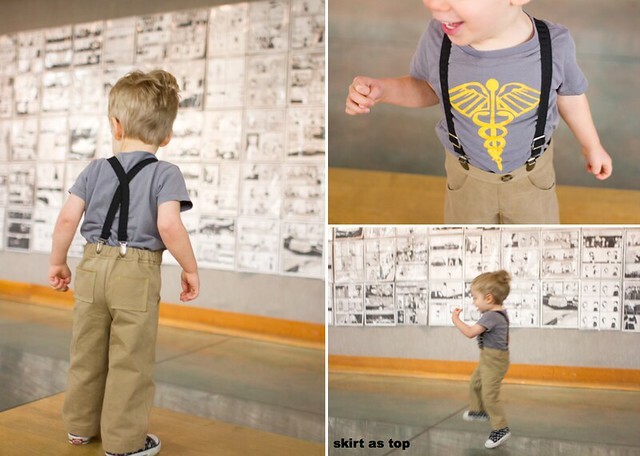 i made the suspenders using this tutorial, which was awesome. i liked that it had adjustable vest buckles, made it feel authentic. can you tell O had a blast modeling? i had hoped to get photos at an art gallery but also didn’t want to take him to the actual art gallery. suddenly i had the idea to go to Powell’s where they have a rotating art exhibit in the Pearl Room. black and white art, plenty of room for photos, not too crowded, nothing breakable, free of charge. perfect. now, while little Cameron climbs back into bed to sleep off his crazy afternoon, head over to check out what his buddies are up to! 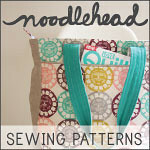 our fabulous guest this month, Shannon from luvinthemommyhood, sewed Sloane! white fringe coat, you guys. WHITE FRINGE COAT. her daughter is the perfect mini-Sloane, truly. and my partner Jess, oh you know her, she’s just over there sewing leopard print vests for her 3 year old – she did Ferris and her little guy also got WAY into the role. check it out! 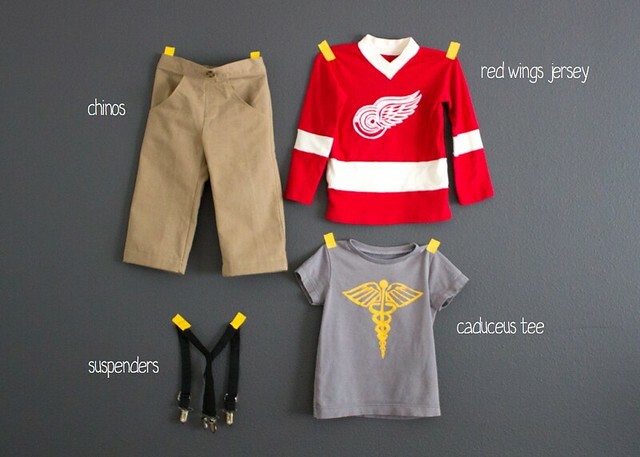 every month or so, Jessica and i (plus a guest blogger) sew an outfit (or outfits) for our kid (or kids) inspired by a movie we love. 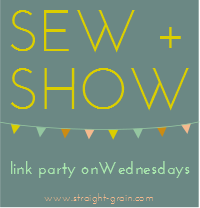 our next guest will be Sabra from Sew a Straight Line! oh man, those freezer paper stencils are fantastic!! the whole outfit is, of course!! Love it, great job 🙂 Now I have a hankering to watch this movie! Incidentally, Fantastic Mr. Fox was on tv the other night…so we dvr’ed it…still haven’t seen that one! A film petit marathon you say…? haha so dang cute. This is such a fun idea, I love it and the outfit is SPOT ON. What a perfect little Cameron! So awesome! Oh my goodness, this is so adorable! I love it! Über cute! Your outfits are perfection, as usual. Love those t-shirts. You’ve got mad skills, woman. Mad skills. I just went through all three of the outfits you guys sewed and they are AWESOME. This is such a part of my childhood and I’d recognize each of these characters in a second. So much fun! thanks! to me they’re costumes you probably have trouble saying perfectly by memory, but are so recognizable, for sure. like i didn’t know what was on Cameron’s t-shirt but as soon as I saw it i remembered…fun to do the research and get the little details. Love it! 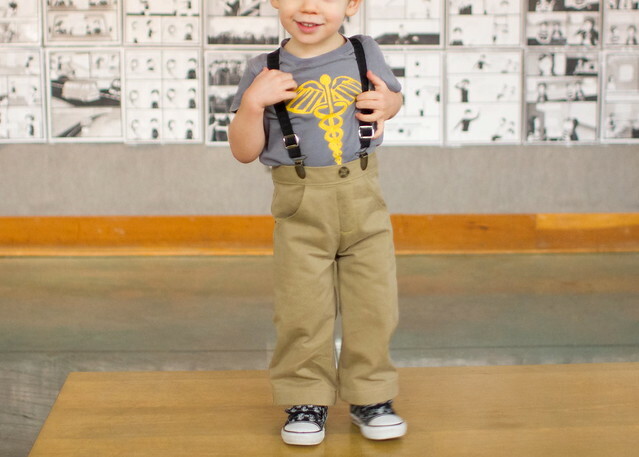 You can’t help but smile when you see him in those suspenders! Such perfection. The outfit spot on, the photoshoot spot on. O is the perfect little Cameron!!! Love this. 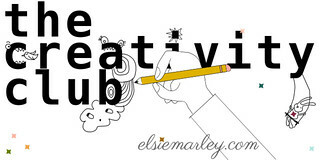 I am SO excited to see what you, Jess and Sabra whip up for next month! OOOOOH, dying of cuteness over here! Love these! Off to see the others. 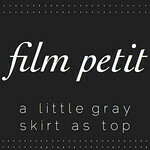 Your Film Petit series has become the thing I most look forward to in blogland. Such a great idea and even better execution –the pictures you guys take always brighten my day! NINE TiMES! I freaking love this so much! love love love!!!! this was a total win! Oh, so iconic! This came out so cute, and yes…totally wearable, too. I love it, and I would love seeing who noticed the ‘costume.’ Love. cute, cute, cute! love it all…and now i need to go watch ferris bueller. it’s been a while! !!!! This is so awesome. My (super cool and worshiped) baby-sitter/neighbor growing up was the youngest of 4 sisters, so I thought she had every cool thing that ever existed. She baby sat us for whole days and a few over nights and on one of those trips brought Ferris over. We watched of over and overZ we loved it so much. Total special place in my heart. I love Cameron’s outfit, you nailed it! Have I told you before that I am a little bit in love with you?! Seriously, I so look forward to these posts! 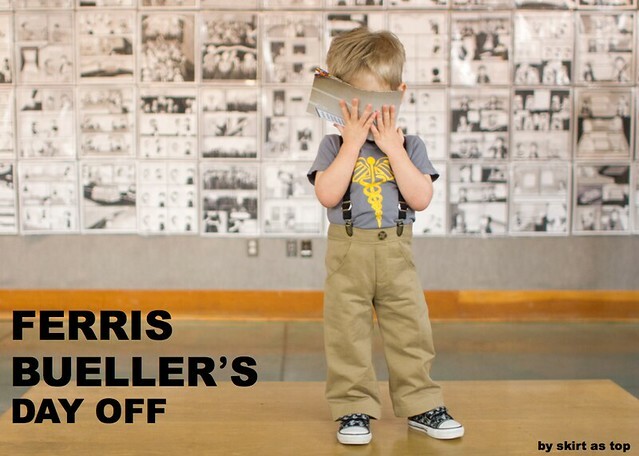 Ferris Bueller – AHHHHHH!!! Love it!!! so cute! I love Cameron…..The gray T-shirt is pretty wicked awesome. So is your stenciling! That room at Powells is perfect! 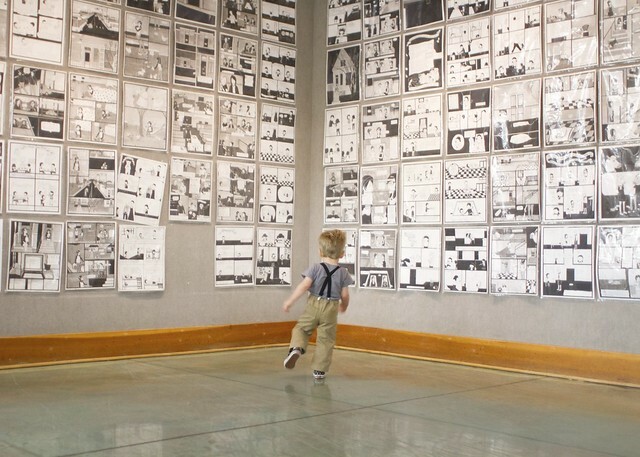 I’m hoping to get my kids there while we visit, and I didn’t know there was an art exhibit section to check out. Okay, seriously, you guys are amazing! This is so awesome! Honestly the cutest thing ever, and I love all the stenciling! This is awesome! once again! I remember watching Ferris Bueller with a babysitter when my parents were gone overnight. My little sister, who was probably 5 or 6, drops the f-bomb right after, the babysitter was a tad panicky. haha! Your hand-cut stencils are superb, Kristin! hahahaha! that’s awesome. thanks, stef! 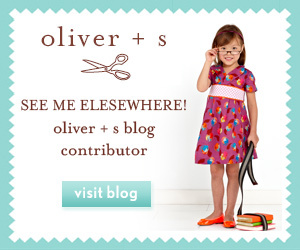 what a fun movie to choose – O. as mini cameron is to die for! i love how the suspenders hike up the pants, all 80s style. perfection once again! this is so amazing kristin. I even figured out how to login so I can leave comments again just for this post. yes yes yes!! Awesome post! Now I really want to watch FBDO again! O is a great Cameron! I am always so impressed with your freezer stencil skills!!!! This outfit is so cute! And O is getting SOO big!! thanks, kat! oh i know, he’s growing up really fast. You girls are amazing. I looove these looks! You ladies really are SO amazing!! Oh the talent that you three have! I can’t believe this outfit and those stencils! WOW!!!! Pure awesomeness, Kristin! And the background!!! Everything is perfection! FERRIS BUELLER YOU’RE MY HERO! When Cameron was in Egypt’s land…. Great attention to detail…you nailed Cameron’s outfit! Ferris Bueller’s Day Off was THE movie to watch during sleepovers in middle school/high school. One of my all time faves..I can’t believe my oldest hasn’t watched the movie yet. I’ll have to rectify that! Eeek! O makes THE most adorable Cameron. This is just so perfect. This is SO perfect! I love the hip tees! Nice work. Thought you could appreciate this… When I was 16 my boyfriend was taking me out to a special dinner that I had dressed up for (my mom made the dress), and as we were driving to the restaurant my boyfriend was looking at me and not the road and he rear ended a Jaguar. Oops. It was the principal from Ferris Bueller! We were half scared shitless, half laughing our asses off. Turns out he was so nice and didn’t even exchange info even though his bumper got dinged. I can still remember that pink dress my mom made me! Ohhh brilliant. I hope you do more 80s movies. I loved this movie. (Still can’t believe my hubby has never seen it.) This Film Petit is fantastic. Perfect little remakes. 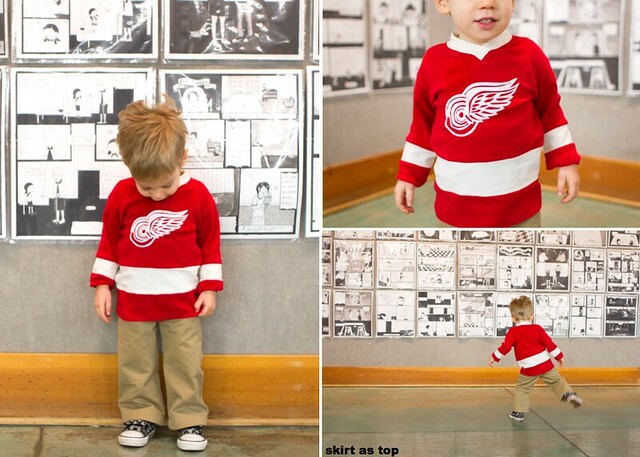 That red wings jersey is downright awesome. This movie is seriously one of my favorites! And these photos are so freaking precious! I am so in love with these two outfits, you don’t even know. 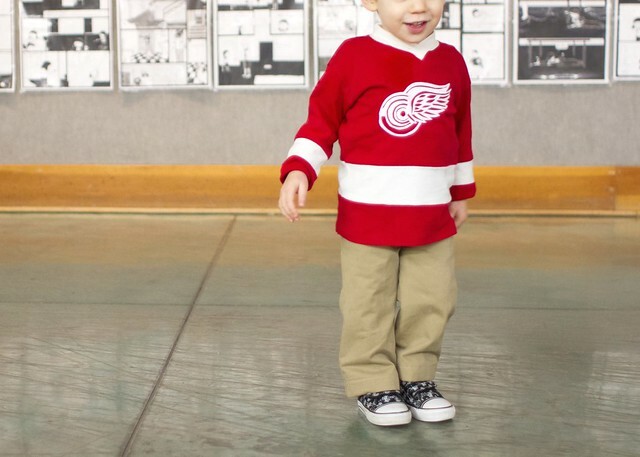 Coolest kid. OMG, this is too cute. Who does not remember this movie, even abroad. Great series!